Cooking brown rice, or at least cooking it well, is tricky. The goal is to soften the texture of each grain's fibrous bran coating—a process that takes longer than that called for in the cooking of white rice—without causing the rice to become mushy. Unfortunately, the labels on most packaged brown rice recommend an ineffective method that suggests boiling water and rice in a two-to-one ratio, then allowing the mixture to simmer for 40 minutes or more, until all the liquid is absorbed. We followed those directions and ended up throwing away more than a few pots of unsatisfying rice. 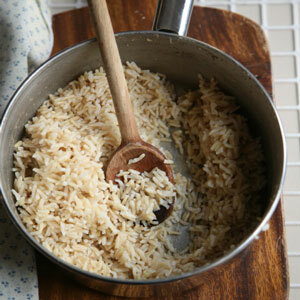 What we ultimately found is that brown rice looks and tastes the best when it has been boiled and drained like pasta and then steamed in the small amount of moisture that remains in the pot. The boiling cooks the rice, while the subsequent steaming allows the grains to retain their integrity and come out light and fluffy. 1. Rinse rice in a strainer under cold running water for 30 seconds. Bring 12 cups water to a boil in a large pot with a tight-fitting lid over high heat. Add the rice, stir it once, and boil, uncovered, for 30 minutes. Pour the rice into a strainer over the sink. 2. Let the rice drain for 10 seconds, then return it to the pot, off the heat. Cover the pot and set it aside to allow the rice to steam for 10 minutes. Uncover the rice, fluff with a fork, and season with salt.